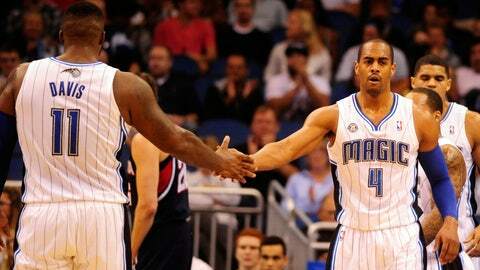 Magic shooting guard Arron Afflalo (4) celebrates in the first quarter against the Atlanta Hawks at Amway Center. ORLANDO, Fla. — The Orlando Magic might be able to go .500 on their six-game homestand after all. For the second game in a row, the Magic shot better than 50 percent to cool off a team which had been playing well. With Arron Afflalo’s 21 points leading a balanced effort in which seven players scored in double figures, the Magic came away with a 109-102 victory over the Atlanta Hawks. The win marks only the third time in the last 12 months that the Magic have posted consecutive victories. The most recent time was when they won at Atlanta and at home to Philadelphia in the two days before Thanksgiving. Afflalo, who turned his left ankle Friday night against the Detroit Pistons, was one of four different Magic players to make a 3-point field goal in the fourth quarter. The Hawks had won five of their last six games and are one of only three Eastern Conference teams which don’t have a losing record. This was their second game since losing starting center Al Horford for possibly the rest of the season with a torn right pectoral muscle. Hawks forward Kyle Korver extended his NBA record streak of making at least one 3-pointer to 100 games when he hit one early in the second quarter. The Hawks, who went 16 of 39 from 3-point range Saturday night against Charlotte, followed that up by going 15 of 39. Guard E’Twaun Moore played after missing the Magic’s last three games with a right thigh contusion. He had three points in 11 minutes off the bench. The Hawks played without DeMarre Carroll (sprained right thumb), who had started at small forward in all 30 of their previous games. The Magic fell behind 85-84 after a basket by Hawks guard Shelvin Mack with 6:55 to go but responded by scoring the next nine points to take the lead for good. Jameer Nelson had a reverse layup and a 3-pointer over that stretch. Maurice Harkless had his best game since being taken out of the Magic’s starting lineup a month ago. In the second quarter alone, he had 11 points and a dazzling alley-oop lob pass to Tobias Harris from just over the midcourt line. After scoring a season-high 58 points in the paint in defeating the Pistons, the Magic had 28 in the first half and 18 over the final two quarters. Tuesday vs. Golden State, 5 p.m. (FOX Sports Florida).